It’s human nature to want to be “connected” or “in the know.” In the past, not knowing where new water and food sources are could result in death. 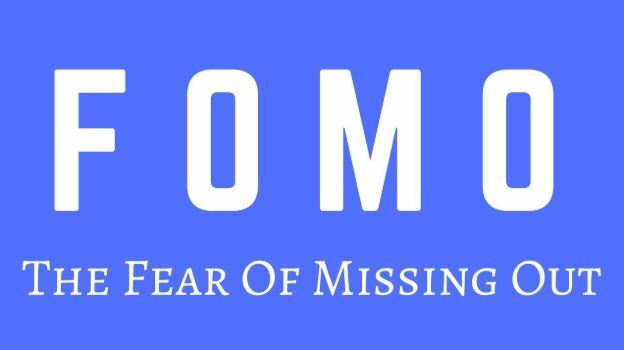 The situation now isn’t as dire as it was before, but the Fear of Missing Out (FOMO) is causing people to become afraid of missing out on the latest trends, products, and ideas. While FoMO was only included in the Oxford dictionary in 2013, the idea has been around for a long time. Every generation, from Baby Boomers to Gen Xers, has always had the desire to be in the loop, but it could be argued that the rise of social media has taken this fear to new levels. According to a MyLife research, 56 percent of social media users are afraid that if they’re not active, they’ll miss out on the latest news, upgrades, events, and status updates. Marketers can, and have been, leveraging this fear and incorporating it into their strategies. This makes particular sense considering that studies have shown that 69% of millennials experience FoMO and more than half have made reactive purchases because of it. In short, these consumers have bought something just because they’re afraid of missing out. The flash sale is a very common FoMO marketing campaign. The idea of limited stocks and/or a limited time period naturally creates a sense of urgency. It also creates the feeling of scarcity when it comes to products. This leads to a major boost in conversions, as seen during Black Friday sales, end of season sales or anniversary offers. Event organizers have also taken advantage of FoMO by limiting the number of seats or participants allowed in specific events. Some even offer exclusive seats and bank on the idea of a limited special offer to push people to purchase tickets. While this has been proven effective in music shows or conferences, a lot of businesses are now incorporating this idea to drum up excitement and interest in their podcasts or marketing webinars. Loyalty programs are another sure-fire way to ensure long-term customer retention. By giving customers timely rewards and the odd special prizes, companies create a FoMo effect among those who are not customers or loyal members yet. This fear of missing out on special gifts and freebies will result in more people joining a company’s loyalty program scheme. Letting your users or customers help is another good FoMO strategy. Some companies utilize user-generated content (UGC) to let site visitors and potential customers see and experience how “real people” use their products and services. This, in turn, leads to others wanting to experience and share their experiences too. Examples of these are marketing campaigns where consumers submit their photos or use certain hashtags. Giving away free products is undoubtedly a great way to attract customers. But you can make it even more compelling by limiting the freebies you give away. This is why some brick-and-mortar stores only offer a special discount or give a free gift to the first 200 customers. This then forces thousands of people to line up for the product. The fear of missing out runs deep in most consumers. However, the desire for instant gratification and the popularity of social media has given this fear an added dimension. No matter how you decide to use FoMO, you should incorporate it in some of your marketing campaigns in order to generate more sales and keep your brand relevant.